A great look at the pony horses who are often not recognized. Thanks for starting this thread. Looks like it will be very interesting. I have noticed the pony called Cinch and thought he was rather unusual. Glad to read he is such a sweetheart. The article about him is very well-written. There is a very loud (loud = extremely spotted) appaloosa that I see at Santa Anita. Does anyone know who he is? I can try and see if he is one of the horses featured? Thank you so much for starting a thread that features my "Ponies of the Track" articles!!! 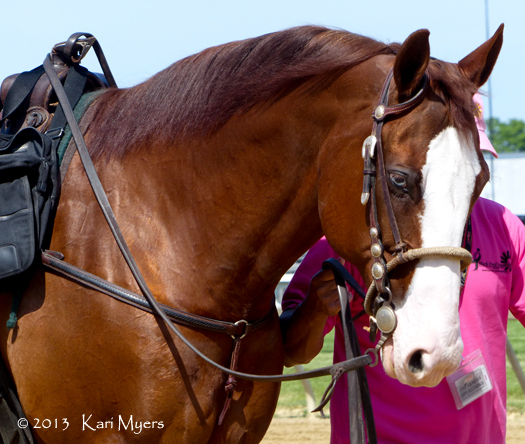 I love talking to these ponies' riders/owners, learning about, and writing about these fantastic horses. The Appaloosa at Santa Anita is named Indio. I have not featured him yet, but hope to in the near future, as I own and show Appaloosas and would love to feature an App! No problem they are very well written and it's great to hear about the "other horses" in the sport. Looking forward to learning about Indio. To PastTheGrandstand: I don't know how often you visit this website but just wanted to tell you that I'm absolutely loving your blogs and I bookmarked your site so I can go back and catch up on all of them. It's refreshing to read about the people and horses we see on the track all the time doing such an important job but never know anything about, and I'm thrilled you are uncovering their fascinating stories. The love they have for their ponies is obvious in the way they braid and groom them to make them look their best. You're a fine writer and have come up with a wonderful and different idea for a series. I wish you the best of luck with your writing career... you're well on your way already! BTW... who takes the beautiful pictures that accompany your articles... mom, sis? Wonderful story! I love the stories about geldings, they are the best ever! Love Mr. Meso's story as well!! Thanks for sharing here. Randy, I'll answer for Mary Cage (Pastthegrandstands), pictures are taken by her mom, Teri. What a talented family they are!